Louis Dembitz Brandeis was an American lawyer and Associate Justice on the U.S. Supreme Court from 1916 to 1939. Brandeis was born in Louisville, Kentucky in 1856 to a family tolerant of Jewish and Christian rituals. In later life Brandeis might be best described as a secular­humanist. Although he completed his secondary education in Germany, he returned to the United States where he studied law at Harvard. After settling in Boston, Brandeis became a successful lawyer spending a good deal of his time pursuing cases with a political bent. In particular, he enjoyed representing small companies against giant corporations, and aiding the cause of the minimum wage against companies opposed to this principle. In 1912, he supported Woodrow Wilson's nomination for Presidency and in 1916, was appointed a Supreme Court judge, the first Jew ever to be appointed to this position. At the time of his nomination to the Supreme Court by Woodrow Wilson on January 28, 1916, the Senate had never before held a public hearing on a President's Supreme Court Nominee; they had all been confirmed on the day of their nomination. However, it took four months of Senate Judiciary Committee hearings until the Senate brought the nomination of Brandeis to a vote. Brandeis was confirmed as the first Jewish Supreme Court Justice in a Senate vote of 47 - 22 on June 1, 1916. Brandeis showed little interest in Jewish affairs until the turn of the century when a combination of his professional work and a changing political climate brought about an alteration. He was introduced to Zionism by Jacob de Haas, an English Zionist, and later still by Aaron Aaronsohn, the Palestinian botanist and founder of Nili. 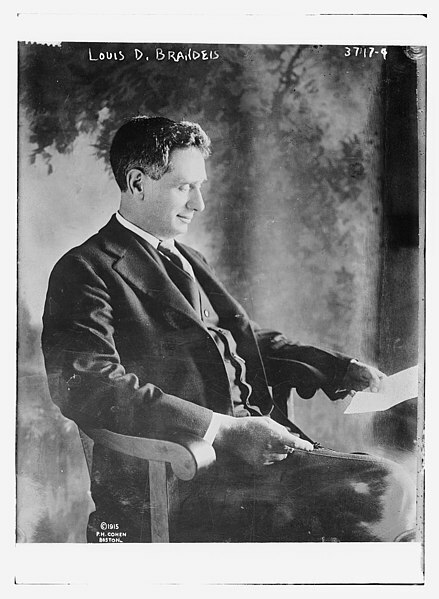 Brandeis became active in Zionist affairs during the First World War, when he accepted the role of Chairperson of the Provisional Executive Committee for General Zionist Affairs. Brandeis had a major impact on the American branch of the Zionist movement, drawing to it a number of sympathizers, improving its organization and its finance. Whilst he resigned his official position on joining the Supreme Court, he nonetheless worked behind the scenes to influence President Woodrow Wilson to support the Zionist cause. After the war, Brandeis headed a delegation of American Zionists to London where at a conference differences emerged between Chaim Weizmann and himself. These arguments over the role of the organization and its pursuit of political activities caused a rift between the two leaders with Weizmann gaining the upper hand. Brandeis withdrew from Zionist activity although he continued to take part in Eretz­Israel economic affairs. Brandeis did intervene from time to time in political matters for example he appealed to Roosevelt to oppose the British partition scheme of 1937 calling instead for the whole area of Eretz­Israel to become a Jewish National Home. Brandeis represented a rather different genre of Zionism, one born out of the American context that affirmed Zionism as part of American ethnic identity. It was Brandeis who coined the term that "to be a good American meant that local Jews should be Zionists." He died in Washington, D.C. in 1941.